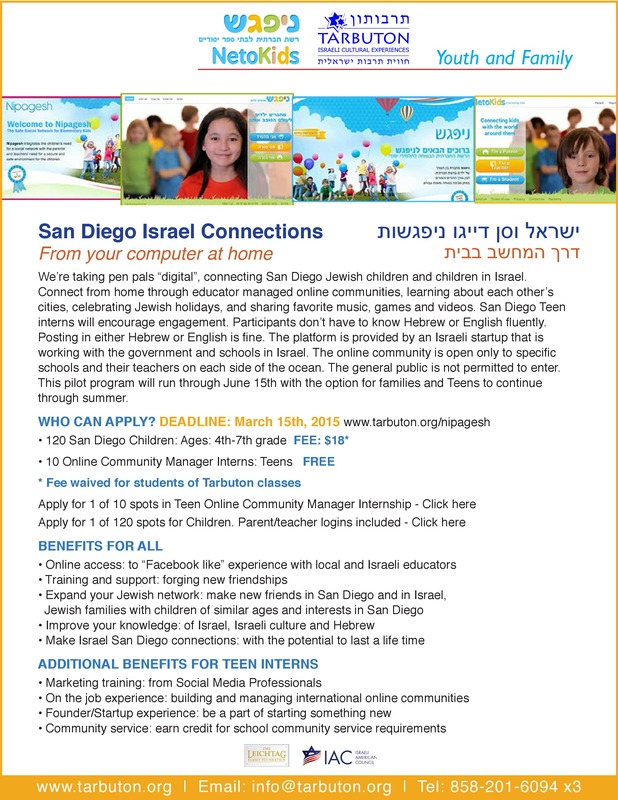 Tarbuton Nipagesh Flyer 2015 We’re taking pen pals “digital” connecting San Diego Jewish children and new friends in Israel. Connect from home through educator managed online communities with new friends in Israel learning about each other’s cities, celebrating Jewish holidays, and sharing music, games and videos. San Diego Teen Interns will encourage new friendships and engagement. Participants don’t have to know Hebrew or English fluently. Posting in either Hebrew or English is fine. The platform is provided by an Israeli startup that is working with the government and schools in Israel. The online community is open only to specific schools and their teachers on each side of the ocean. The general public is not permitted to enter. This pilot program will run through June 15th with the option for families and Teens to continue through Summer. How much will this cost my institution or program to participate? There is no fee in this pilot year for families enrolled in the Tarbuton classes. There is an $18 fee for families who choose to join us in the open enrollment after March 15. Interns are volunteers and there is no fee for the internship. Educators, we are happy to have 2-15 of your kids or more from your enrolled student body in Sunday School programs and/or Day School. The Tarbuton will subsidize up to 120 students. Join a classroom, or entice a few kids. Encourage a Teen intern from your family, organization or several. If the pilot is a success we will expand it next year. How much time will it take for a Parent or Partner Educator to participate? Parent, Teacher/Director can be involved or not. This is a family and/or school decision if you integrate this into curriculum in the program or simply give their children access to do at home. Educators can create additional online communities themselves and/or choose to use only those already built. How much time will this take for my kids? As little or as much as they want. They can login and participate whenever they like and as often as they like. Is this a program only for use during school hours? We anticipate most of the use will come from home, freely and comfortably. Though the platform supports media rich opportunities to supplement classroom experiences should educators want to integrate use in the classroom. What grades are ideal to participate? We believe grades 4th-7th are ideal. However, this is your choice.